When I heard that Prince would be performing in the Netherlands, of course I knew I would be there for at least one of the shows. Other than my guaranteed presence, I didn’t know anything about the context of the performances. Would it be a European extension of the Welcome to America tour? No clue. But obviously it didn’t matter. As you know by now, Prince could show up in a bathrobe, perform karaoke Backstreet Boys, and I would cry tears of joy from the very back row of a stadium. The context really didn’t matter. But it turns out the context was almost as cool as Prince himself. The North Sea Jazz Festival is an annual weekend of incredible music in Rotterdam. Each day offers an unreal line-up of artists on separate stages. So not only must you decide which day(s) to attend, you must also sketch at least a loose schedule to be sure you get a taste of everything you want to see and hear. Prince closed-out each day of the festival – Friday, Saturday, and Sunday. Since I could only afford one day (and barely that), I chose Sunday, with the hopes that he would save the best for last. The other artists scheduled for that day would be a bonus. But honestly, I didn’t know who else would be there until after I purchased a ticket. Some of the artists from other days who I sadly missed were Chaka Khan, Janelle Monae, and Esperanza Spalding. So Sunday in Rotterdam. It was going to be tricky. Prince wasn’t scheduled to finish until 1:30am (the earliest of all three days). And since I don’t know anyone in the city, I thought about staying in a cheap hotel for the night. That was going to be expensive and likely a hastle to get to after the show. So I decided I would either rely on a combination of taxis and night trains to get me back to Amsterdam after the festivities were over, or commit to partying all night until I could return home in daylight. As it turned out, sometime during Snoop Dogg’s performance, I decided it would be an all-nighter. I arrived at the festival a little bit after 5pm. The main stages were all indoors, which seemed unusual. It felt like a mall of live shows, with arrows pointing to the various “rooms,” for the performances. Everyone carried around little schedules for the day, listing at least eight options for any given time. Music poured out from every which way…to the right, in the back, upstairs. Lesser-known bands (all high quality) performed on smaller stages outside, which felt like refreshing transition spaces between the big shows. Anywhere I walked, at any time in the day, I could find something new, and likely exciting. In addition to the music there were food and drink stands all over the place. But to purchase anything, I had to hand over a wad of cash to get tokens, the only accepted currency throughout the festival (a stroke of capitalist genius). I turned in token after token for beer, dutch pancakes, and apparently some other stuff. Because by the time I reached Prince, I had to purchase more tokens. The first main performance I saw was Raphael Saadiq. And it was a legitimate, 1.25 hour show. I pushed my way toward the front and danced along with the equally hype crowd. Brilliant. The next big one was Tom Jones. I didn’t stay for the middle of his performance, as I was distracted by another band outside. But I did return just in time for him to close with his version of Kiss, which felt fitting. I danced like I was the biggest Tom Jones fan in the room, which I can assure you I was not. Snoop Dogg was next in the same spot. So lots of folks just waited in the hot venue for him to come. And perhaps to everyone’s surprise, he started on time. Rage opened up for him. I was happy to see her and her afro puffs, rockin’ on with her bad self. Warren G was also there. And of course they did a Nate Dogg tribute. Tall Dutch people in front of me prevented me from seeing everything. So I’m pretty sure I missed some scantily clad ladies doing whatever it is that they do. But it was for the best. I enjoyed the music without having to see everything. And I danced to the point of exhaustion and sweaty discomfort. Oh, and then there was Bootsy Collins! He’s a legend who I imagined I would never see perform live. But there he was, in all of his funky, sequined glory. At this point, I was just so thoroughly entertained, it almost didn’t matter that Prince was starting in 30 minutes. But yeah right. I had to leave Bootsy early. On my way out, I grabbed a piece of apple pie and briefly stopped for a jam session happening in the hallway. But then the pie and I made our way over to Prince’s venue, almost in a jog. I fear I’ve already gone on too long before getting to the best part. Shoot. So the show wasn’t nearly as flashy as the stateside version. He started off with ballads on a barely lit stage. And then we got a bunch of the classics, as he gave a shout to those of us who understood. And I have to say that was most of the crowd, an incredible crowd of like-minded lovers of Prince. Two encores later, it was 3am. He left the stage. But about 25 percent of the crowd refused to believe it was over. We shouted, chanted, and banged on chairs. But when they finally took away the mics at 3:30, we accepted that he was long gone. I took a taxi to an after party, with the hopes that I would dance down a soul train line with Prince and Bootsy. But no such luck. But I did hear some more live music that kept me going until after 5am, at which time I was completely faded. With incredibly sore feet and blurred vision, I walked to the train station in daylight. And I rode the train back to Amsterdam with grown-ups who were starting their Monday morning after full nights of sleep. But as crazy as I must have looked, and as exhausted as I was, it was a perfectly fitting ending to one of my favorite days in the Netherlands. I’ve been asked a number of times what I’ll miss most about living in New York. I always answer, “the people,” meaning my friends and family. Genuinely good friends aren’t easy to come by. And I’ve met plenty of good people in every city I’ve lived in. But something special has happened since I’ve lived here, giving me the opportunity to meet and fall in love with so many people, all of whom I hope will remain life-long friends. In celebration of these friendships, as well as, of course, my upcoming move, I decided to party hard during my last few weeks in NYC. Not too much packing or Rosetta Stone studying has been done during this time. But I’ve certainly been having a great time. My going away party was on December 30th, the day before New Year’s eve and just days after the snowstorm that mysteriously paralyzed NYC. So I worried that no one would be able to come to Brooklyn to celebrate my upcoming departure. Fortunately I was wrong. Unfortunately I was too drunk to remember if I thanked everyone for coming. The evening started with a pretty light dinner and a pretty strong mojito. So I was already feeling free before I even arrived at the party venue. And speaking of the venue, it was perfect: a private little movie theater with a bar, and seats that were formerly bucket seats from old cars. We were able to drink what we wanted, watch the little movie I created about my family history research, and then dance to the playlist I put together for the occasion. It was delightful. I was both the drunkest and happiest person at the party. Well, until I realized I had to say goodbye to people…then I started to cry. But it was a happy cry. Oh, and then when I got sick on the way home. But it was a happy puke, trust me. The following night was New Year’s Eve. Two friends had come up from DC to stay with me and help me celebrate through the weekend. And we met up with some more friends at the party, where I danced more and drank a little less than I had the night before. We ended the night around 5am, at which time on that particular holiday you will find vomit in every car of the train on your way home. The sad thing was that on our train, all of us were too drunk and tired to either notice or move. Exactly a week later was my last day working. Although I didn’t know what was planned, I knew my friends/coworkers would plan something funny and/or fun for my send-off. And to be honest, since the ante has been upped each time a person leaves, I figured I might be the first one in awhile to get a lollipop and a pat on the back. I couldn’t have been more wrong. The office has two floors. So around 5pm on the big and final day, I noticed all of the staff heading upstairs. They were discreet. But it was obvious. Then I could hear things being said on the microphone, including my name one or two times. Around the same time, I was met in my office by the CEO holding a blindfold (trust me, not a typical Friday). I was blindfolded and led upstairs, all the while hearing my friend on the mic welcoming me to the party. With the blindfold off, I was looking at a sea of purple, with everyone seated as an audience and wearing at least one purple item. There was a large purple seat reserved in the middle, along with a purple fedora, a purple boa, and an open bottle of champagne with a long straw. My fantasy. I turned around to see eight of the most wonderful people dressed to the nines, looking remarkably similar to Prince and the Revolution. That alone would have been enough. 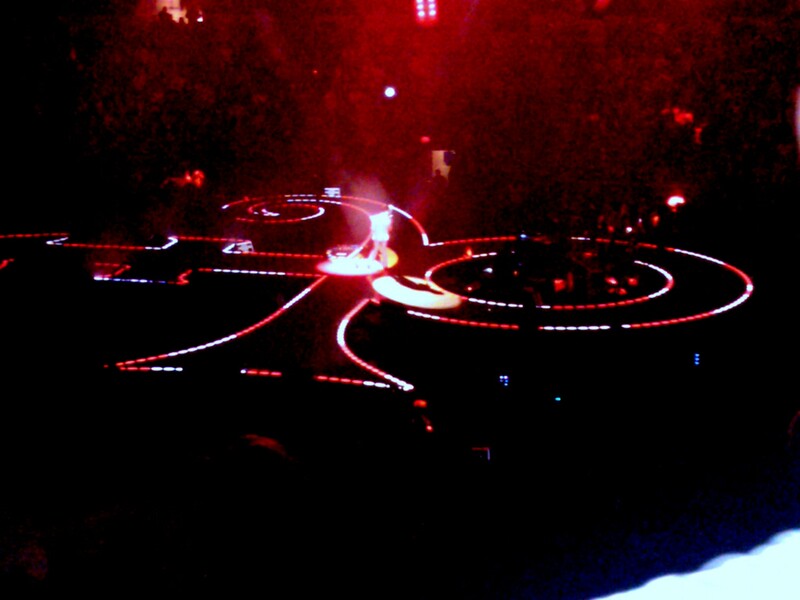 But it was followed by a scripted and carefully choreographed Prince medley, telling the story of my time there. If I hadn’t been having such a good time dancing and laughing, I would have been crying because it was all so lovely. The evening continued with more drinking and more dancing. But the performance was the highlight. And now, with less than a week left, I don’t expect my remaining days to include much partying. Rather, I need to make up for lost time on the whole packing project. And perhaps I’ll be struggling with the new, nagging feeling that I’m actually going to miss New York. Who would have thought? Welcome 2 America – Well, thank you, Prince. I was with Prince last night – at Madison Square Garden. As you may know, I sincerely love Prince. And I’ve loved him pretty much for as long as I’ve appreciated music. Really, he’s one of the reasons I appreciate music. Although I didn’t learn the meaning of many of the lyrics until much later, I always understood the brilliance of it all. His voice, every instrument, the moves, individuality, ridiculously cool, and really sassy – but yet so quiet and shy. He’s my ultimate. In a way, my borderline worship becomes a problem when it comes to expectations. I build him up in my head, enjoying each time I see a video of him or hear any of his songs as much as a normal person would enjoy a big cupcake or a peppermint patty – delighted, satisfied, and a bit blissful. When it comes time to see him in person – live, in the same room with him – it makes me a little nervous. Is that weird? First, I worry I won’t enjoy the moments together if they have to be shared with thousands of people. It’s too important to me for it to be so public. And it’s a 100 percent guarantee that those people won’t understand me or what I feel for him. They’ll be assholes who think they’re cool because they know all of the words to 1999, but have never heard of Lovesexy. Or they’ll constantly complain that they miss the nasty Prince since he no longer grinds on the stage or performs Darling Nikki. Or, worst of all, they won’t want to dance. But then the unreasonable fear is that he’ll disappoint me. How could he disappoint me, we all wonder. We all know that he could walk on stage and curse us all out, and I would simply gaze into his eyes. But the small fear is there. He’ll walk on stage and for the first time in my life, I’ll wonder what all the fuss is about, basically questioning my faith. Seeing him in person could reveal the lack of true depth of my love – I’ll be exposed as a fraud (even though now I’m exposing myself as a crazy person). So Prince concerts come with a bit of anxiety. The first opportunity I had to see him was in 2004. A friend bought me a ticket to see him for shortly after I moved to Oakland. It was the Musicology tour. I loved that album. And Prince was just recovering from a bit of a nonsense period – so it was good to have him back. It was the perfect way to welcome myself to Oakland. The only problem was timing. The concert was on Thursday, September 9, 2004, about two weeks after my move. My father died on Saturday, September 4th. I flew right back to Philadelphia. But several days later I returned to Oakland to commit to the move, and to see Prince. I figured Dad would have been pissed if I chose to sit around and mope rather than enjoy Prince for a couple of hours. So I did. At least I did my best. The concert was amazing. He did old and new, and it felt like a party. But I’m pretty sure I cried through parts. Not really what I imagined my mood to be at a Prince concert. Six years later, I got my second chance. At almost an exact opposite time in my life (I’m super happy, I’m moving east rather than west, I’m chasing not running), the Welcome 2 America tour feels like perfect timing. Less than a month before I leave “America,” only Prince could provide me with such an ironic send-off. And it was perfect. Well, Prince was perfect. And the music was perfect. And my seat was perfect. There were only two problems. I was sitting alone since I wasn’t able to get a group of 3 seats together to sit with my friends. And then there were grumpsters sitting next to me – literally sitting. How can you sit through Purple Rain, you freaks!! (I wanted to scream that, but didn’t). How can you have your arms tightly crossed over your chest during Let’s Go Crazy, you no-good-party-poopers! And how does the mere sight of Sheila E. not make your head want to explode, you monsters! Fortunately, my annoyance with my neighbors was peripheral. I danced like I was auditioning for America’s Got Talent (if my talent were fanaticism). And I screamed so very much – I even gave myself a pep talk that involved accepting the fact that I may do permanent damage to my voice. And plenty of other good people around us came prepared for the party. And that’s what it was – a party. A party with Prince. A really great party. I didn’t mind that it wasn’t an intimate setting. And it solidly confirmed my genuine love and appreciation for him. It’s a real thing. And I’m coming to terms with the fact that I narrowly missed an opportunity to go to the after party (damn me and my uncharged phone). Really, nothing could make a night with Prince anything less than perfect. Thanks for the right send-off, my friend! I know. I know. Since I started this little blog, the birthdays of many heroes have come and gone: Frederick Douglass, Malcolm X, Bob Marley, and Oprah Winfrey. The anniversaries of significant events in history have passed: the murders of Patrice Lumumba, Dr. King, and Biggie, Ghana’s independence, Brown v. Bd. of Ed. But you can just assume all of those days are significant to me (I remembered and acknowledged most of them this year…promise). What you may not know (if you’ve known me for less than 2 hours) is that I’m a die hard Prince fan. I just can’t help it. So on his birthday, I figured it only appropriate for me to pay some type of tribute. 52 years blessing this earth with your genius and crazy. In your words, I truly adore U.